Flexible artificial tendons of the thumb! Welcome to the forums! I need to spend some time looking through the posts, but they seem most interesting! Welcome artbyrobot! - I will enjoy following this thread. Thanks for posting! @Whit Thanks for the welcome Whit! I'm glad you like my project idea and I look forward to giving you updates! Thanks again! Very nice... very long term... very ambitious project. I do exactly the same thing... find something that is interesting enough and complicated enough to keep me working on it. Best way to learn. I am most interested in the eyes... and it looks like it will be a while. You are going to use webcams... so you are going to have an on-board computer? @rjo_ Thanks for your words of encouragement! Yes I will be using webcams nesting inside the eyeballs so that they are hidden and the robot just appears to have normal eyes. 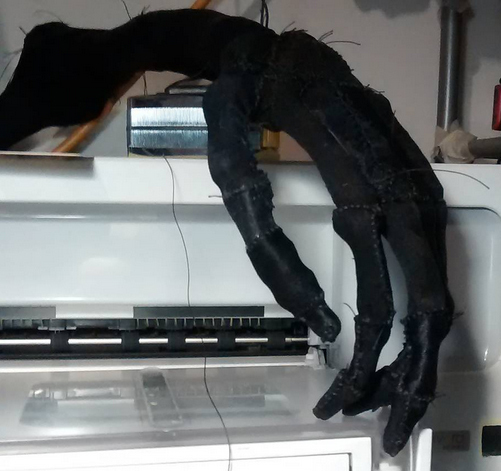 The eyes will be servo powered to move around so he can look around like a human does. I will have an on-board computer - or about 20 really. A main fanless pc in the chest will run the main logic engine and the mini arduinos and servomotor controller boards will chip in their processing power for lower-level decisions and management tasks. I can't help but notice that you are considering using a****** for your peripheral processing. Since this is a Parallax forum, why don't you consider using a Propellar Micro for such control. With eight cogs (cores) you would gain a lot in simplification probably with fewer boards required. "Maybe you're in tre [sic] wrong forum. I don't see any relevance with A******." I don't doubt plumbers are smart, my dad was one. However if thats your career, I'm somewhat skeptical of the computing/programming chops you seemed to highlight. Just a tip though, a dozen uC's and an I5/I7 isn't going to give you much more than a basic automaton. @koehler - I am widely promoting my project in social media and robotics forums in order to interact with the robotics community as well as anybody really. I have been getting great suggestions and encouragement as well as giving people inspiration and something cool to follow along with. I can assure you I am not trolling when it comes to my sincere commitment to building this robot according to my written plan of attack. Plumbing is not my career and I have been coding for about 6,000 hours over the past 4 years on a massive video game botting project in c++ that involves a lot of automation and A.I. This experience will be not only a huge confidence boost but a huge time saver when it comes to getting down and dirty with the coding of my robot! As far as getting more than basic automation and being limited by onboard processing power, I believe those concerns will be met through potential cloud tapping for extra computing using external computers and wifi. PLUS, over the next 5-10 years of the robot building, I believe processing power will continue to speed up exponentially which will surely make those extra processing needs you are mentioning become a trivial matter to solve and at an affordable price to boot... Thanks for the feedback and thoughtful commentary! Of course, it looks like we will get more transistors still, and hence more cores. So if you want to make use of those for performance gains you had better have a firm grip on how to parallelize your problem. As to your project aims: "I want the robot to ultimately move like a human, be able to walk, run, jump, do chores, dance, do sports, have conversations realistically, paint, do sculpture, etc." This is far in excess of what some of the most advanced and well financed AI and robotics research teams have done in the world so far. I cannot imagine how you will pull off even a tiny part of it. Not that one should no have fun trying of course. I watched this guy's (artbyrobot) twitch last week, he's a lot different than what you might infer from this post. Someone asked him about AI and his response was something like, "It will only be as good as my coding, I'd be happy with something that could mow the lawn." Pretty sincere answer if you ask me. So how much does an arm weigh? @xanadu - thanks for checking out my twitch! Yeah I stream live about 100 hrs a week while I work on my robot project. An arm should weigh about 3-4lb with bones, exoskeleton and motors but that is just a rough estimate. The bones themselves of the arm weigh about .8lb I think. I'm using hollow lightweight composite fabrication methods. @artbyrobot: Good luck with your project. I like your enthusiasm. Just keep making forward progress, one step at a time. Apparently the humanoid bar is set pretty high. What is this "twitch" that everyone is speaking of. An where do I get to see it. I admire your audacity and long term vision, artyrobot, but I worry that the goals you have outlined have been pursued by thousands of people for decades, ever since Babbage dreamed of building a computer or Alan Turing determined what a computing device can and cannot do, so far the resulting robots and AI are still very crude. By all means use Windows 10 and let Cortana's AI help out! @erco thanks for the encouragement man! I've seen her I think on youtube she's called an actroid. @heater - twitch is a website for live streaming. Thanks for the kind words and word of warning. I think decades ago the processing power and availability of components that are both affordable and powerful and miniature was bad. I think over the next 20 years we will be seeing alot of projects emerge like mine. I'm just showing mine off as I go so that I can share and learn with other's help. @erco - I will hand code all of my AI no way I'd trust integration with other programs that I don't fully understand. That would lead to bugs for sure... Unless my AI queried someone else's AI and chose its own decision based on the decision of some other AI... hmmm... that could be a thing maybe... But then if someone elses AI ran locally and was hardware intensive, again, bugs could emerge... or if their AI had memory leaks I could get unforseen bugs I didn't understand on account of that as well! I'd have to query some other AI running on a different operating system then... hmmm fascinating idea! Here's a little update on the project. 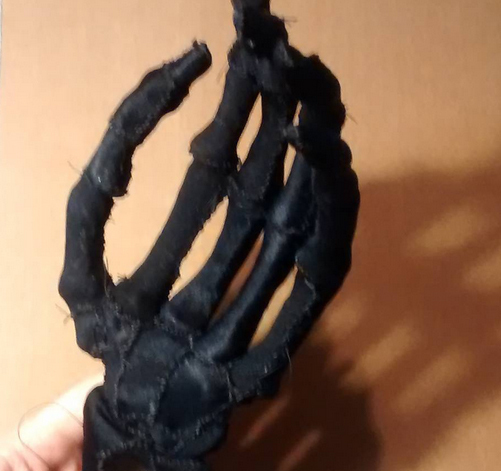 Finally got the hand bones joined and ready to rig! So you are using the black stitched-cloth as ligament to hold the bones in place, is this correct? 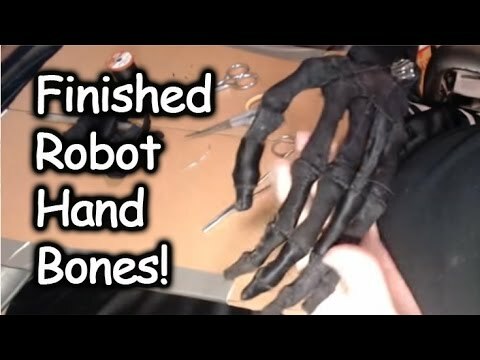 How did you decide the shape of each individual hand bone, did you print something from a digital file, or sculpt each one free hand from X-rays of your own hand? I was looking for scan of an entire human skeleton, but I saw something shiny and became distracted. I never considered sculpting due to mu limited ability. Will you sew tendon directly to the ligament glove? This looks like a bunch of cool methods that might work well. @Heater Yeah the robot wearing surgical glove was unsettling haha. @prof_braino - yes, spandex fabric is the ligament glove. Also, I sculpted the bones using images of bones and xrays of bones that I got off Google image search. I also ensured they were the same length as my fingers. The tendons/muscles will be sewn directly to the ligament glove, correct. 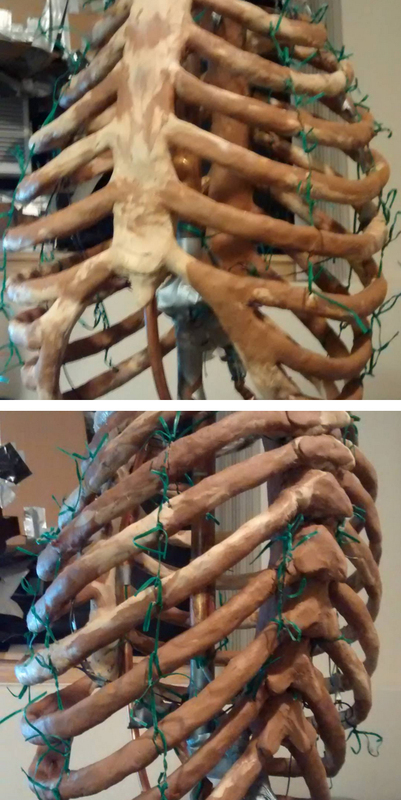 Just finished sculpting the rib cage in clay. Here is my latest progress on the build. It is an exoskeleton mesh of my head to aid in sculpting the skull and defining the mass of the neck as it meets the skull.